Should You Major in Music? There are academic music classes, lessons, ensembles, and general education course that you have to take. Music is one of the most difficult majors you can choose, but it can be well worth the extra work. It can be hard to know what majoring in music is really like until you get there. As a recent Bachelor of Music graduate, I want to give my thoughts on who should, or should not, major in Music in college. What is it about music that makes you want to study it? There are many reasons why we pick up an instrument. It is a great way to be creative, you can make some life long friends, and music education can help your skills in other ways. If you want to major in music, it is good to treat music as more than just a hobby. You don’t have to be practicing in every spare moment of your time. You should, however, be fairly serious about music and your instrument. Private lessons are important for building your skills outside of your school music program. They also allow you to explore solo music and harness your craft on your own time. While private lessons can get expensive, they are an invest in your music career. There is this school of thought that if you enjoy anything else as much as music, then you should pursue that anything else. I don’t fully agree with that idea, but it does have a bit of merit. If you are interested in an outside field, particularly one that goes well with music, keep that interest around. You can double major or minor in a second field. Doing that builds your marketability for after you graduate. I chose to add a minor in Spanish, and so I can work with the Spanish language to increase my chances of finding a good job. Complementary majors include communications, business, languages, theatre, and so many others. If you just started learning music for the first time in high school, you probably don’t have enough experience to really flourish as a music major. While I did not start my primary instrument, flute, until then, I had previous experience on piano, violin, and other instruments. I understood music theory, and I knew how to discipline myself to make good progress. You don’t have to play your instrument for years, but you should have a good grasp of the fundamentals of technique as well as other basics. Knowledge of scales, arpeggios, and a few solos is enough to get you started. Just know that there is a lot of work involved in studying music. If you go into college with a jumpstart on music theory and some slightly challenging repertoire, it will make your first semester that much easier. Having s strong background in music is also a benefit. What is it about music that you want to achieve? Think about what you might want to do after you graduate. Do you want to perform? Teach? Something else? Narrowing down your long term goals will help you decide what to concentrate on during your time in college. If you want to try your hand at composing, see if you can take a class or lessons to help you build your portfolio. If performance is your goal, seek out performance and competition opportunities. For future music educators, be sure you are taking all of the required methods courses. If your goal is to work in arts administration, use your elective credits to take classes in business or even pursue it as a minor. Music is a tough field to study and make a career in, and it is nice to plan ahead for the future. Being passionate and driven will help you tremendously, and setting goals will give you direction. If you decide now or later that music is not the major for you, you should definitely keep playing. Ask the music department at your college about opportunities for non-majors. You can probably join the large ensemble for your instrument and maybe take lessons, depending on the professor’s load. It’s not required for you to major in music to keep playing in college. You do not have to be a professional to play music. There are many amateurs who keep their passion for music alive well past college. I hope that, no matter your career goals, Music will stay a part of your life. There is nothing to be had but benefits. 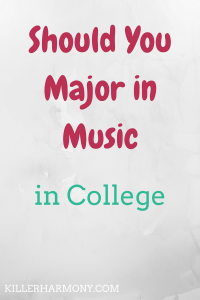 Are you considering a major in music? What do you want to know about it? Let me know in the comments! Previous Previous post: What Instrument Should You Play?